The recently released App for remotely moving the gangboard via one’s mobile phone and tablet and a telescopic gangboard that can also be used as a small crane. These are the two new products Besenzoni is showcasing at Boot 2019. 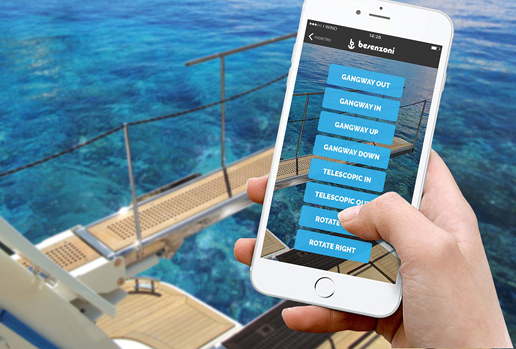 The new App (which is completely) by Besenzoni Unit Control, now usable on IOS 9.0 devices and Android 7.0 and above, allows for the remote movement of the gangboard, whether it be of the kind that folds in or that is attached externally. The gangboard showcased at Boot can also be used as a small tender crane; it is made with stainless steel and can be finished, depending on the user’s preference, with an opaque or reflective service, while the top is in plexiglass with a teak finish.